Heat oven to 350°F. In large bowl, break up cookie dough. Stir or knead in flour until well blended. Reshape into log. If too soft to cut into slices, refrigerate up to 30 minutes. Cut dough into 24 (1/4-inch) slices, reshaping each into a round.On ungreased cookie sheets, place cookies 2 inches apart. Bake 6 to 8 minutes or until light golden brown. Immediately remove from cookie sheets to cooling racks. Cool completely, about 15 minutes. In small bowl, mix frosting and food color until well blended and desired red color. 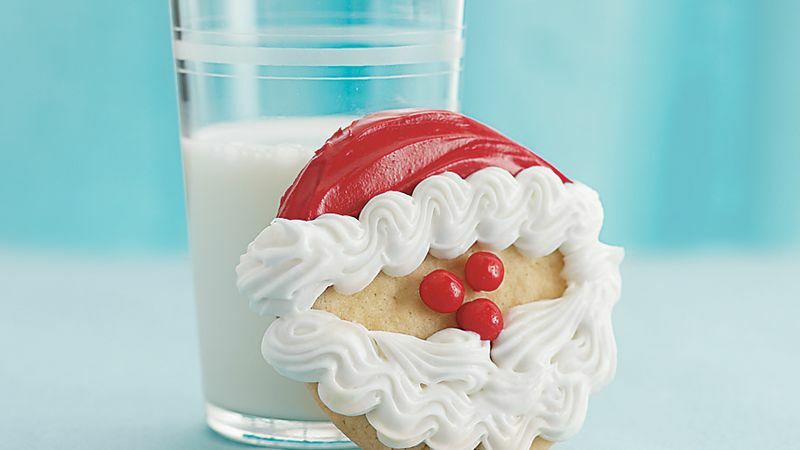 Decorate each cookie to look like Santa with red frosting and baking bits.